We cover a ton of different gadgets here at the BGR Deals team, but we’ve never covered anything else that’s quite like the Depstech WiFi Borescope Inspection Camera. It flew off of Amazon’s virtual store shelves the last time we told you about it, so we wanted to bring it to your attention again now that Amazon is offering a little discount. 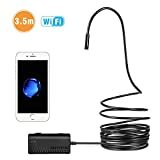 As a refresher, this wireless endoscopic camera can connect to any iPhone or Android phone wirelessly, and you can snake it just about anywhere since it holds its shape, unlike similar products. Want your phone to see where no other phone can? This is exactly what you’ve been looking for. Unique Blue LED technology,6 adjustable blue LED light on camera tip, it greatly helps to improve image brightness and clarity even in dark or low-light condition. Moreover, 2 Megapixels HD camera offers you a wonderful experience of recording a clear close range HD video in AVI format and snapshot image in JPG format with three adjustable resolutions 320×240, 640×480, 1280 x 720.